Public transit is simply another welfare/redistribution scheme. We all know that those who need financial assistance have access to many taxpayer paid programs through local, state and federal redistributors. There are currently about 180 means-tested welfare programs including food, housing, medical care and education. These programs cost taxpayers about $1 Trillion a year and do not include most of the costs of public transit. Public transit in low density/low ridership areas such as Pinellas County is one of the least efficient welfare programs. Figure out the capital and operating costs of moving 20 riders a day on a bus - any bus (although most PSTA buses are capable of accommodating 50+ riders, the average occupancy is 8 riders). "Route 444 averages 41 riders a day. 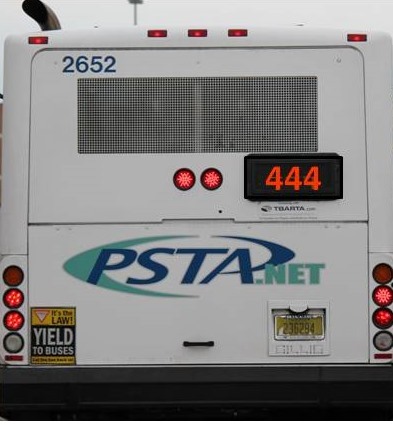 Board member Mark Deighton pointed out that at a cost of $363,000 a year, the PSTA is spending about $8,840 for each rider." I suspect this is only the operating cost and does not include the amortized capital costs. I suspect those 41 riders are actually 20 riders taking round trips because transit agencies count boardings, not unique riders. If so, that brings the cost/actual rider to $18,150/year. Whether it is $8.840 or $18,150, it is too much and it reflects the inept management of PSTA by politicians and incompetent management personnel. Anyone with a SNAP card could be given a PSTA debit card good for two rides a day using Uber or a taxi (with restrictions of course). That alone would save taxpayers from the insanity of paying $363,000 per year for such low utilization of assets we pay for. similar size in the US. of operating costs. Free rides should be made available on a very limited basis​ and only offered to​ those who can prove the need for financial assistance. required to pay at least 50% of operating costs with no discounts for passes. Taxpayers pay for 100% of capital costs and should not have to pay any more than 50% of operating costs to subsidize those who do not meet the requirements for financial assistance. Those of us who do not use public transit (98% of Pinellas residents) are paying too much for too little. Our local, state and federal taxes support public transit. We do not object to helping people in need, we are very opposed to seeing our tax dollars wasted every day.